Raspberry Pi has always been fun and easy to build projects. Its powerful ARM architecture and open-source Linux based Operating System has help us a lot in getting our projects online in no time. 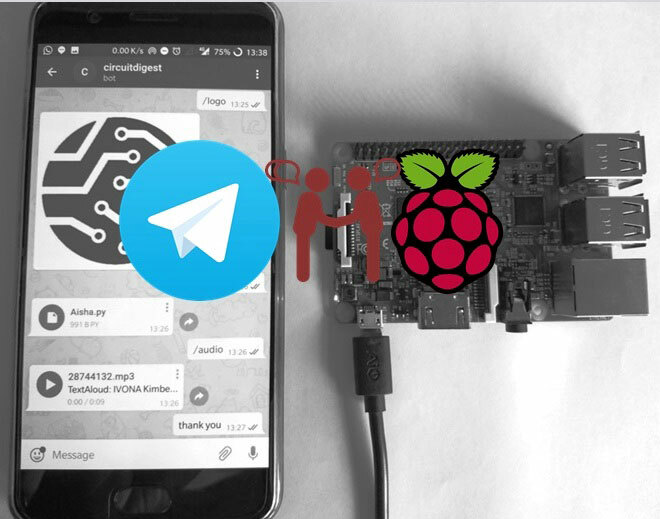 In this tutorial we will learn another interesting way to share data (files/photos/videos/audios/text) between Raspberry Pi and our Mobile phone through a popular chat application called Telegram. For those who are new to Telegram, it is a chat based application available in play store for Android (also available for Iphone and windows) that is very similar to Whatsapp. It has over 100 million downloads (as on 5-10-2017) on play store and people claim it to be faster and more functional than Whatsapp (fingers crossed). One special features of this application is that they support bots. Meaning this smart phone application can not only be used by Humans but also by machine. In our case the machine will be Raspberry Pi. Once you train Raspberry Pi on how to act as a bot, anyone (if you make it public) can chat with your Raspberry Pi like chatting to any normal person and even share Photos Pictures Documents and Audio files. You can even train it to be your own Personal assistant, sounds cool right? Lets learn how to build a Raspberry pi telegram bot. A mobile running Telegram Application. There is not much hardware involved in this project so relax on your chair with your Pi and follow the steps below. If you are new to Raspberry Pi then follow our Raspberry Pi Introduction article and other Raspberry Pi Tutorials. Note: This tutorial assumes that your Pi is already connected to internet and you know how to use the Lx terminal on you Pi. So connect your Pi to internet before proceeding. The first step would be to install Telegram on your Mobile. Telegram is available for Android, IOS and even for Windows platform so just go ahead and download your Telegram application. Just like all application there will be a small Sign Up procedure to start using Telegram, continue with it until you reach your home screen. The next step would be to request the Bot Father to create us a new Bot. On the top right corner of the Home screen there will be a search icon, click on it to search for the name “botfather”. Botfather is a Bot by itself, it will guide you to create a new bot for you. Click on start and select /newbot as shown in the picture below. Now, the bot will ask for few details like name of your Bot and the user name of the bot. Fill those details and remember the username for we will needing it in future. I have named bot as circuitdigest and the username as circuitdigestBot. After this process the botfather will give you a Token for access. This is like the password for your bot, people can control program your bot using this token key. So keep it safe and do not share it with anyone. Once you have received this token key it is time to move on to Raspberry Pi. Once Telepot is imported into Raspberry we can use this package in our python program to communicate with our Telegram Bot. The complete program to make the above actions is given at the bottom of this page. But just below, I have explained the important snippets in the program to help you understand how the program works. The first step is to import all the libraries, here we will obviously need the teleport library to use the Telegram bot. We also make use of the time, timedate library to read the current time for Raspberry pi. Then we create a object now in which the value is stored. The next step is to create a function for taking actions based on incoming commands from Telegram app on Mobile. Here the name of the function is action. It is inside this function where the bot comes to life. Our bot cannot initiate a conversation on its own, it can only reply if we ask something. So each time we ask something there will be chat id. This chat id is something similar to a address, only using this chat id a bot can reply back to us. So the first step is to read the chat id and the message it is trying to say to us. We also print the received message for debugging purpose. The next command will be /time, to which we reply the current time. We already have the time and date in now, here simply split it based on hour and minute and add it as using the str function. The next command will be /logo, to which the bot will fetch an image from a url and send it to us. A image can be sent either from a URL or from the hard disk. Here I have just used the URL which displays the logo of CircuitDigest. Okay now comes the most important step, this is where we give access of our Telegram bot to the Python script. Here we name out bot as telegram_bot and assign it the token address that was given by our botfather in step 3. In the line below I have removed the last few digits of my token as a matter of privacy. We also use the print get me to display the details of the Bot on the shell screen, this will help us notice things working. Hope you understood how the program works, now let us move to next step. As said earlier the complete program is given at the end of this page, you can also download the same from here. Once you open the code make sure you change the token address of the program to your token address. Here, my bot user name is circuitdigestBot. If you get your bots name here it means everything is going fine. Once you see “up and running” it means that you bot is ready for action and can now reply to your commands. Now, all that is left is to check how good your bot is responding for your program. Search for your bot name in my case it is “circuitdigestBot”. Search for username and not or Bot name, you user name should end with bot. Once you open your bot, click on start and type in any commands like /hi, /time, /file, /logo, or /audio and you should be replied accordingly. Note: You might have problem with /audio and /file if you have not changed your directory to a proper file that is available on your Raspberry Pi. You can use the shell script to see what your script is currently responding to. The complete working can be found at the video given at the end of this page. Hope you understood the tutorial and now will be able create this Raspberry pi telegram bot and communicate with Raspberry Pi using Telegram App. Alas! If you have any problems let me know through the comment section and I will try to get back to you. Also, let me know how you liked this project or what you would like me to build using this in upcoming projects. Also, in our next tutorial. We will make this look cooler by changing the way we are sending commands and to something more related to hardware on Raspberry Pi. hey, thanks for this cool tutorial. There's just one problem that all the files uploaded are corrupted! I had to fix all the indents and spaces, but the code functions. Adding # -*- coding: utf-8 -*- to define the character set helped me figure out it was the indents. Check your token address! Is it correct? hi! i am beginner in raspberry. i tried to run your code on my rasperry pi 3 with jessi. when ibstart the script, there is a syntax error in line one. independentbofbwhat thereisbwritten in line one. I think you pasted the code dorectly and ran! @B.Aswinth Raj: what do you mean with "You have to assign the token mainly "? Instead of sending circuit diagram image, what should be done to send a particular image we have in our raspberry pi? How would i do if i want to receive a message to my telegram everytime the python progam is run? My wish is to receive a message without writing anything on the telegram chat. Where should I put it? plrase.. Follow the steps given above and that is the "how to"
if i d like it send text to me by I dont send command How should i do ? Hi, I am getting this ImportError: No module named loop. Any idea on how can I help this? for connect rasberry pi to internet we need ip static or dynamic us ok? I could just use the telegram module,but i want to know why this error happened. Could someone explain it? Hi, thanks for this tutorial. How can I start it automatically when I turn on raspberry? Import Error : No Module named "Telepot"